Following in the shoes of Ti West and Eli Roth has to be a daunting task. Ti West the man responsible for some of the best horror films of the last 10 years made a bad Cabin Fever movie so how could Kaare Andrews make this one succeed. Trying to up the ante in films that were already batshit crazy doesn’t seem possible so what do you do? Take the familiar, a group of friends on a weekend getaway, add in something new, a bearded Sean Astin being held against his own will by creepy scientists, hire Vincent Gustani to handle the makeup effects and throw as much crazy at the screen as you can. The only question is does it work? The short review…. Yes. This movie absolutely works and is not only a worthy sequel to Cabin Fever it washes away the sour taste left by Cabin Fever: Spring Fever. 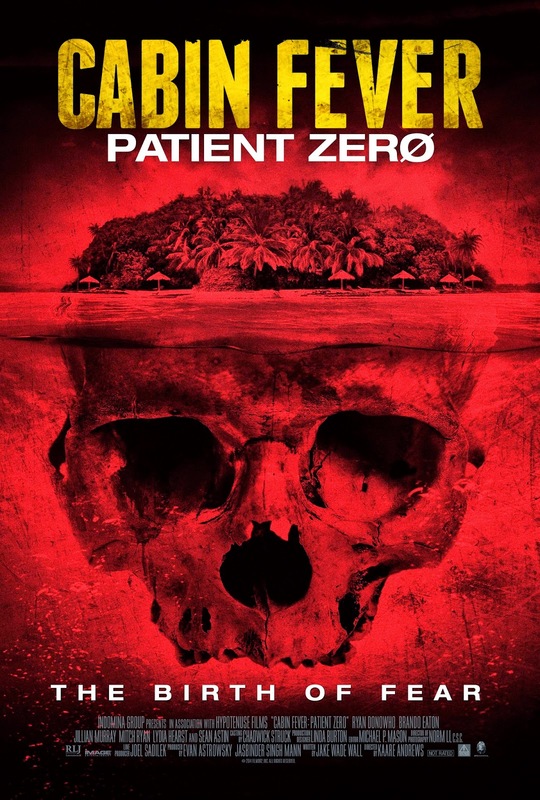 Patient Zero follows two stories at the same time. The first character we are introduced to is Porter (Sean Astin) a man being held against his will by what appears to be less than ethical scientists. Porter is immune to the flesh eating disease that we’ve seen in the last two films and might hold the key to a cure. The second story we follow introduces us to a group of young people having a bachelor party on a secluded island, the group consists of two brothers, their friend and one of the brother’s girlfriend’s. Yup, just let it go. Don’t spend too much time thinking about why three guys and one of their girlfriends would have a bachelor party on a secluded island. It's only a matter of time before these two groups of people will meet and all hell will inevitably break loose. The opening shot of the film is a hauntingly beautiful slow motion shot that sets an impressive tone for the film to live up to. If you are aware of the prior Cabin Fevers this shot lets you know that you are in the hands of a capable filmmaker who will be putting his own stamp on this familiar material. I loved Kaare Andrews 2010 film Altitude so I knew he could make a good movie but I still went into this one with some degree of trepidation. With all that being said this film is in no way a film for everyone. This is a film for the fangoria crowd. This is an old school splatter fest but made by a gifted filmmaker. This film isn’t schlocky cheap feeling. Even though I’m sure this film was made on a micro-budget it feels big and polished. Most of the over the top gore fests of the late 70’s and 80’s felt amateurish and fairly juvenile and while this film is every bit as gory as any of those films it has style and solid performances all around. If you liked High Tension or Wolf Creek give this a look. I think you might be pleasantly surprised.